Beaver County Peace Links: The Taliban are Winning: Will We Absorb the Lesson? The Taliban are Winning: Will We Absorb the Lesson? This war never should have happened because it was always unwinnable, unaffordable, and therefore unpopular. .
March 12, 2014 - The U.S. national security elite, mainstream media, and therefore most of the American people, are in strategic denial of the fact that the Taliban are winning the war in Afghanistan. Why is the denial “strategic”? Because our government and military establishment cannot easily admit failure without damaging our superpower status and their multiple careers. However, such a denial also risks never learning the lessons. Defeat has multiple possible meanings. It doesn’t mean the insurgents will overrun Kabul any time soon. It is possible, however, that the Afghan security forces will implode along with the Humpty-Dumpty regime of President Hamid Karzai. The likeliest possibility is the Taliban ruling over vast swaths of the southern and eastern regions, outside the authority of the Afghan state, leaving Afghanistan partitioned for an indefinite interval. The point is that the United States is withdrawing ground troops from Afghanistan without vanquishing the Taliban. Since the Taliban are not losing, they are winning. 150,000 U.S. and NATO troops have failed to dislodge them, and by many accounts, have only strengthened their will to fight on. Fatalities among the U.S.-supported Afghan soldiers, more and more on their own, have doubled in the past year. The U.S. and NATO are falling into the graveyard of empires. The U.S. and NATO are falling into the graveyard of empires. Pity the American military families and the feminists. The cynical hope of Washington planners is that the collapse happens after 2016, not before. This war never should have happened because it was always unwinnable, unaffordable, and therefore unpopular. Starting under Bush and the neocons, it became a liberals’ war, which recruited feminists, humanitarian hawks, soft-power enthusiasts and Democrats afraid to be blamed as soft on terrorism. President Barack Obama felt compelled to escalate the war before deescalating it. Obama’s calculation, widely shared in the Beltway, was that it was impossible during the 2008 presidential campaign to pledge that he would withdraw from two wars, Iraq and Afghanistan. He bought time in Afghanistan, but now that time is rapidly running out. The latest news in the interminable debate over how to withdraw is whether Obama should leave behind 3,000 troops to defend Kabul and Bagram to prevent the comeback of Al Qaeda, or 10,000 soldiers, the Pentagon’s minimum recommendation. NATO is expected to add a small additional number, mainly Germans and Italians. Either way, ask yourself this: What possible “victory” can be achieved by a Western military force cut by 90 percent? If 150,000 NATO forces, along with Afghan forces of 350,000, did not stop the Taliban why would a core of 3,000 to 10,000 Americans be more effective? The paltry numbers are nothing but a political prophylactic to defend our decision makers against the fear of Afghanistan’s badlands becoming a sanctuary for Al Qaeda once again. More specifically, the White House is terrorized by the political threat of another 9/11 plot. Those are understandable fears, but they could apply equally by now to Pakistan, Iraq, Yemen, all of North Africa and, say, any Muslim ghetto in Europe. Maybe the Bronx or Dearborn. 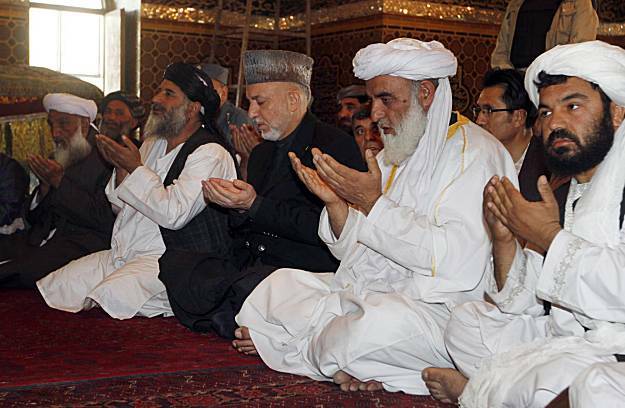 Now it’s revealed that Karzai has “a cozy history with the Taliban,” according to Sarah Chayes, a longtime national security adviser to General David Petraeus and the Joint Chiefs, and who has lived for years in Afghanistan. The Americans are furious that Karzai has released 72 insurgents from Bagram and rejected a status-of-forces agreement with the U.S., just when the appearance of a Western-style presidential transition was being orchestrated. Heavens no, we would not want to offend those Afghan officials. That would be like calling their government a basket case, and such comments should remain private. Thankfully, 66 percent of the American public now rejects this war as not worth fighting. Yet the question of an exit strategy remains, if only to neutralize the rise of dangerous chatter about “losing Afghanistan,” a toxic theme of American politics since the Chinese Revolution. The U.S. needs to accelerate and make public its secret diplomacy with the Taliban, based in Qatar, over a prisoner exchange involving the swap of Guantanamo inmates for the Taliban captive, American Sgt. Bowe Berghdahl. Kabul can be protected and defended temporarily as a safe zone while power-sharing arrangements are sought among the warring parties, based on the balance of forces on the ground. An international peacekeeping force from regional powers, especially Islamic countries, might be enlisted to enforce the truce and transition period. The Russians and Chinese need to be included. There may be differences within the Taliban. After all, they remain unpopular with large segments of the Afghan population, and have reason to worry about reigniting the civil war. An international consortium, not led by the U.S., might be in their interest. The U.S. should be proposing a full withdrawal of all our troops in exchange for a Taliban good-faith pledge to prevent the restoration of Al Qaeda sanctuaries. And the U.S. should make future Afghanistan assistance conditional on whatever protections for women and children’s education are obtainable. Obama needs to ask himself in one of his private moments, what on earth are so many white Western North Atlantic people doing trying to police Southern Asia? If he leaves a few thousand Americans behind, as “monitors” or “advisers,” he will be risking their lives on short-term counterterrorism adventures. He should remember that not too many years after the humiliating fall of Saigon, diplomatic and commercial ties were resumed with Vietnam, and the Vietnamese today see the U.S. as a balancing force against Chinese expansion. And above all, Obama should continue his “conversation” with the American people about the limits and costs of an empire. With urgent rationales for new American military interventions filling his message box, Obama will be fortunate if he avoids going over the brink. The imperial appetite is restless, and temptation seems everywhere. Imagine if John McCain were president. Even the mainstream media worries about that. It’s probably too much for power-wielders to admit mistakes. Only the public seems to get it. Has anybody in the Beltway heard of cutting your losses? That’s what it takes.